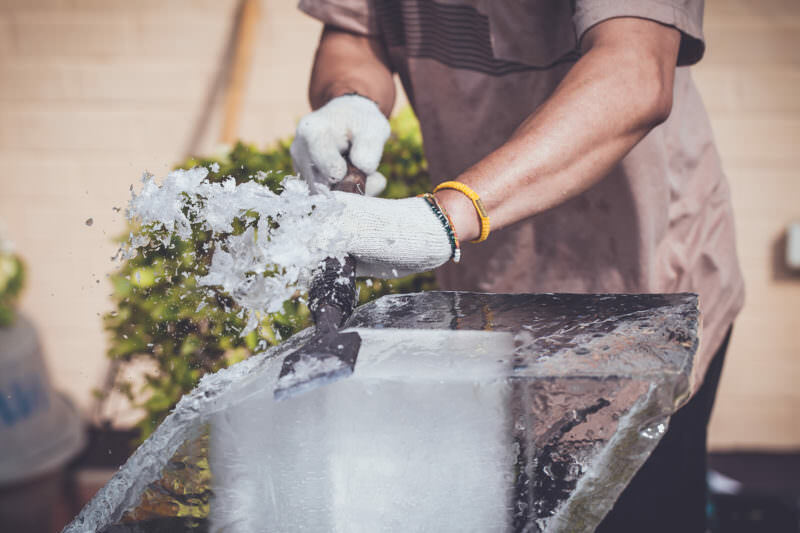 Adjust the Ice to Room Temperature: Also known as “tempering”, taking your large ice block from the freezer and letting it adjust to room temperature allows the ice to become clear. If you look at ice directly from the freezer, you’ll notice it’s quite clouded. Letting the ice sit for a bit will allow the outer layer to melt, and become clear-looking again. 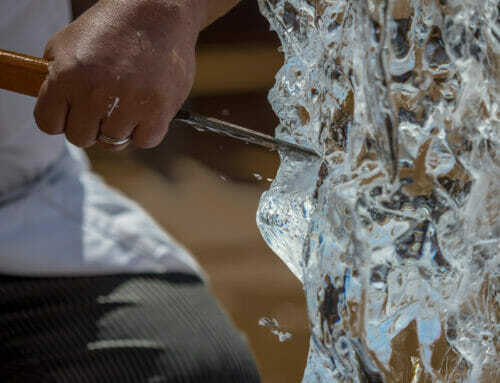 Naturally, the more the ice melts, the easier it will be to work and carve with as well. It depends on the size of the ice block, but most ice blocks from a standard freezer should thaw somewhere between 20-45 minutes. Be sure to check all sides to make sure it’s melted evenly before proceeding. Tools You Likely WON’T Find in Your Kitchen: Making the perfect block ice means you likely can’t just use kitchen utensils you already have. To get the best results (and lessen risk of injury), purchasing an ice pick, a large serrated knife, a large, thick cutting board, a sizeable mallet, a paring knife and linen would be highly beneficial for success. The serrated knife helps with cutting ice, as the jagged edges create an easier cut through the cold, hard surface. Cut Things Down to Size: Before cutting smaller pieces of ice for your drinks, cut the large block in half evenly from the middle, and then again into fourths. To do this, you should hold the ice in place with your ice pick, and then saw a line with your knife across the center of the ice. 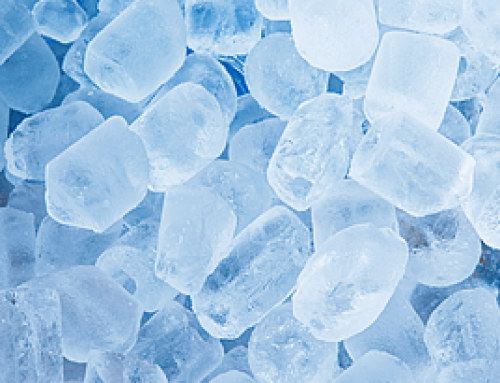 This will help you not only handle the ice better, but will help avoid any premature fracturing. 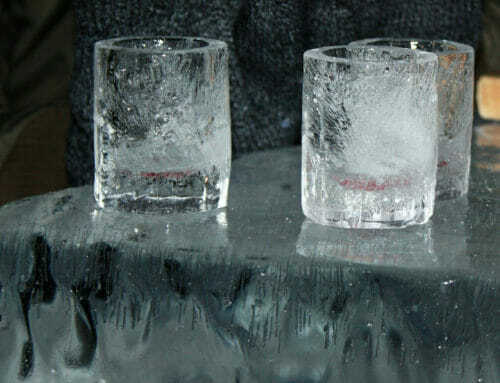 If you’re trying to make the perfect cocktail ice, fractured ice will deplete your resources and you’ll then have less to work with. The Great Divide: Once you have your line created, it’s time to use your mallet. Put your knife back where the line is, hold it in place firmly, and hit your mallet on top of the knife. It may take a few hits to have the ice block split, but it should split cleanly. If not, then likely the ice wasn’t tempered long enough. Wait a couple more minutes and try again. Squaring the Blocks: Once you’ve cut your pieces into smaller “ice cube” shapes, it’s now time to shape it. For the bold, this is where the linen comes in. 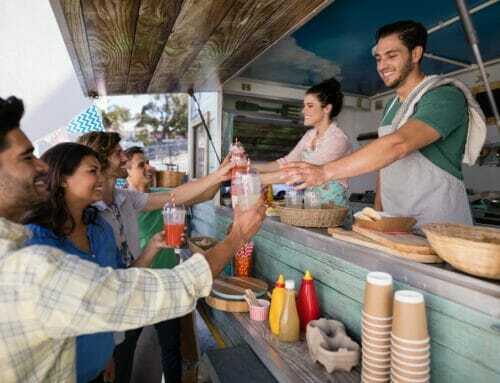 You can hold the chunk of ice in your hand with the linen which helps prevent slippage, and start using your knife to shape it around the edges into a prefered cube shape. However, this is a bit dangerous. An equally useful, but much safer method which we strongly suggest for those newer to ice carving, is to hold the cube against the cutting board with the linen and shape from there. Fix your Mistakes: The final step of this process is fixing the mistakes. Splintering and fracturing are quite common with ice, so don’t get discouraged, especially at your first attempt. Use the paring knife while holding the ice in the linen and shave off the imperfect edges by gliding the knife through the ice slowly. This is a Learned Skill: You know the age old saying – practice makes perfect. 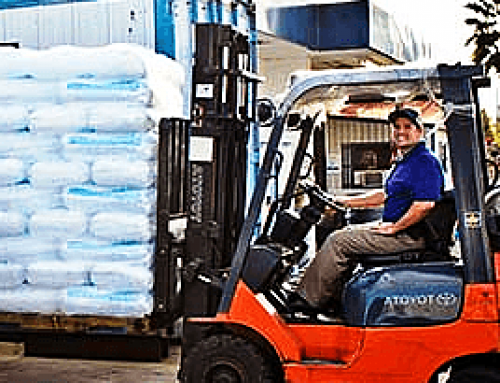 Making block ice is not easy and it’s likely not something that can be picked up immediately. If you’re planning a party, it may pay to practice beforehand so you don’t find yourself in a predicament the day of, or having to run to the store for some sad bagged ice substitute. Remember, bartenders at high-class bars have to practice this skill, and there’s a reason why people pay premium for these cocktails.